The third position is still up for grabs. The factions of the president's Petro Poroshenko Bloc (PPB) and the outgoing prime minister's People's Front at their joint meeting have decided to nominate Andriy Parubiy for speaker and Iryna Herashchenko for first deputy speaker. "The coalition has taken all necessary decisions. 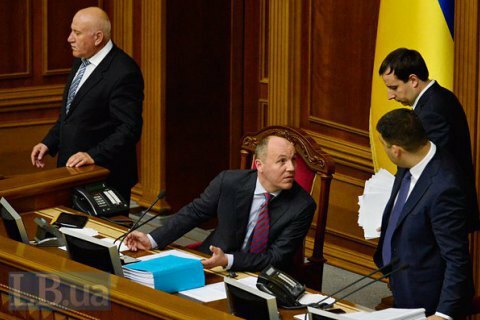 It decided to nominate Volodymyr Hroysman [for prime minister], Andriy Parubiy for speaker, Iryna Herashchenko for first deputy speaker, and on the composition of the government, where one post remains vacant as the PPB has not agreed it yet," a deputy head of the People's Front faction, Viktoriya Syumar, said. She suggested that Self-Help's Oksana Syroyid should keep the post of a deputy speaker. The Ukrainian parliament's presidium consists of three persons: the speaker, the first deputy speaker and a deputy speaker. Currently, these are Volodymyr Hroysman, Andriy Parubiy and Oksana Syroyid respectively.